Visible at latitudes between +63° and −90°. Lepus is a constellation south of the celestial equator. Its name is Latin for hare. The hare is not from any figure in Greek mythology. Lepus was one of the 48 constellations listed by the 2nd century astronomer Ptolemy. It is one of the 88 modern constellations. It is below the constellation Orion (the hunter). It is known as a hare being chased by Orion. This constellation should not be mixed up with Lupus, the wolf. 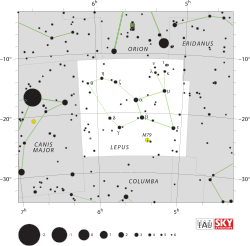 The constellation Lepus as it can be seen by the naked eye. IC 418 is a planetary nebula located about 1,100 light years away. There is one Messier Object in Lepus, M79. It is a globular cluster of magnitude 8.0, 42,000 light-years from Earth. It is one of the few globular clusters seen in the Northern Hemisphere winter. Allen, R. H. (1899). Star-names and Their Meanings. New York: G. E. Stechart. Kunitzsch, P.; Smart T. (2006). A Dictionary of Modern Star Names: A Short Guide to 254 Star Names and Their Derivations. Cambridge (USA): Sky Publishing Corp. The star T Leporis as seen with VLTI. Credit: ESO/J.-B. Le Bouquin et al.